Hands-Free Accessory for Every Tablet PC. Maximize the potential of your tablet, by bringing it to eye level: handsfree! Surf the web or read at length with this steady clamp safely anchored to a table corner as thin as 1/4 in. Adjusts your tablet's screen to landscape or portrait at any imaginable height and angle. Your tablet brings the world to your fingertips. But, you just can’t experience its full potential while it’s plopped on your lap, handcuffing one hand, or stuck resting on a table top. LEVO floats your tablet or eReader at the perfect height and viewing angle while you sit, recline, or lie in bed. Your tablet is a serious device, that brings the world to your fingertips. But, you just can’t experience its full potential while it’s sitting in your lap, monopolizing one hand, or stuck resting on a table top. 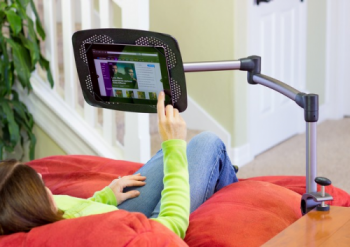 LEVO floats your tablet or eReader at the perfect height and viewing angle, while you sit, recline, or lie in bed. LEVO’s 5 axis articulating swing-arm positions your tablet exactly where you need it most. You simply get cozy, then swing, yaw, and tilt your device into the perfect viewing position. Place your device horizontally, upside-down, or anywhere in-between. Our simple and quick-mounting tablet stand is compatible with all iPads, tablets, and eReaders with our without cases. While most clamps require an overhang of up to 2 inches, our patent-pending clamp is so clever, it can attach to tables with overhangs as little as ¼ of an inch. You can even use it with your side-table, coffee table, desk, counter top, or bedside stand. Clamp it on, adjust the height, get cozy, then swing your device into perfect view. LEVO’s swing-arm quickly moves and folds when not in use, or when you’re ready to end your web-surfing or reading session. When you return, you can quickly swing your device back into position, so you can continue surfing the web in deluxe style at any time of the day! It’s the most comfortable and stylish way to surf and read. Once setup, your device can be attached and detached in about 2 seconds. Weighs just 6 pounds so it's great for traveling too. Quickly spins from portrait to landscape. Works great with or without cases. Attach and remove your device in seconds. Quick release platforms for interchangeability. 5 axis articulating swing arm for quick positioning. Corner clamp firmly clamps to corner or sides of tables so you can take it from room to room. Aluminum frame with super strong nylon polymer joints. Minimum height 5.5 inches, maximum height 16.5 inches measured from top of table to center of device. Compatible with all iPads, Galaxy tablets, Surface, Zoom, Nexus, Nook, Fire, and other tablets and eReaders measuring 8.5x11 inches or less, and weighing up to 4 pounds. We keep one downstairs next to the sofa and one upstairs next to the bed. We use them with a 7" tablet but they would work fine with a 10 or 11" tablet. Well constructed unit. I recently purchase one of these for my new windows 8.1 tablet. It arrived very well packaged and easy to assemble. I was surprised at how sturdy it is. I have no concern of it breaking any time soon. I will be recommending this to my friends and family for sure! The Levo table clamp was delivered very promply and was very easy to install. It is great for holding the I pad especially for a handicapped person. After trying several stands for my iPad, I found this one to be just the one I needed for reading in bed. I can lie flat on a pillow in bed without neck strain. It was easy to assemble and I attached it to my headboard. I am very pleased with this product. I purchased the Levo clamp stand mostly for reading and viewing videos in bed. It arrived quickly and in perfect condition. The stand was easy to assemble and seems like a quality item. I chose the clamp stand over the floor stand because of price. The company advertizes that the clamp can be placed on furniture that has very little overhang, or on a corner. I have tried it on various tables and it does, indeed, work well, especially on corners. This was the main feature that I needed, and the clamp stand delivered. My device is a Samsung Galaxy tab 3 7.0. It is quite small. I had some difficulty getting the elastic cords arranged to hold the tablet securely because the provided cords are way too long and required some trial and error to get right. I think Levo is trying to cover all sizes with one set of cords. A simple fix for this would be for Levo to provide two or three sets of cords of varying lengths, or even sell sized cord sets separately for the terminally fussy. In a perfect world, the stand would have some kind of "fine tuning" of the height. The height adjustment provided works well. It does not deviate from the chosen position. I find that I can't get it just right with the one adjustment. In summary, the clamp stand works very well. The movements are smooth and the device clamps on easily and remains stable when I swing it over my bed or adjust it for use. No more hand fatigue or neck kinks for me. I recommend this product. My wife and I were big fans of the first generation of Levo stands - we have five of them between the two of us. The second generation stands have only increased our appreciation for these neck- and back-saving devices. We have both the g2 Deluxe Table Clamp Stand and the g2 Deluxe Floor Stand. The new stands are sturdier, yet lighter. While the arms are a little stiffer, this is overall an improvement because it makes for a more stable device. The single greatest improvement was the new method for adjusting the height -- the old stands had a tendency to slip downward. The new stands however stay at the height you set them at period. The ability to mount a stand on just a ¼ inch overhang is remarkable. We can't say enough about how these stands make reading ebooks and using tablets more enjoyable by relieving the stress on our necks and backs. While you may pay a bit more for a Levo stand over other stands out there, the versatility, strength, and mobility of the Levo stands are more than worth it.